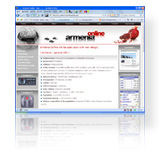 Taxation in Armenia - Land tax .:.::. Landowners and permanent or temporary users of state owned land are land taxpayers. Tax on rented land is levied on the lessor. The land "cadastre" (valuation system) is used to determine the value of the land. Land tax for agricultural lands is calculated at 15% of the net income determined by the "cadastral" evaluation. For non-agricultural land the rate is 0.5-1% of the "cadastral" value of the land. Full exemption is granted to national parks, newly established orchards, vineyards, agricultural and collective farms for 2 years after the collective has taken ownership of the land. Partial (50%) exemption is granted to scientific institutions and organizations using land for research and experiments. Enterprises, institutions and organizations must submit annual land tax calculations to the Tax Inspectorate no later than September 1st of the reporting year, and make quarterly payments before the 25-th day of the month following the reporting quarter. Citizens and agricultural farms pay land tax, taking as a basis the payment notifications calculated by the State Tax Inspectorate and delivered to them before September 1st of the reporting year, in equal parts no later then November 15-th of the reporting year and before April 15-th of the following year.